I know, it is currently not the right time for such big suggestions like this. But I’ll post this anyways, this can probably wait for a later release anyways. 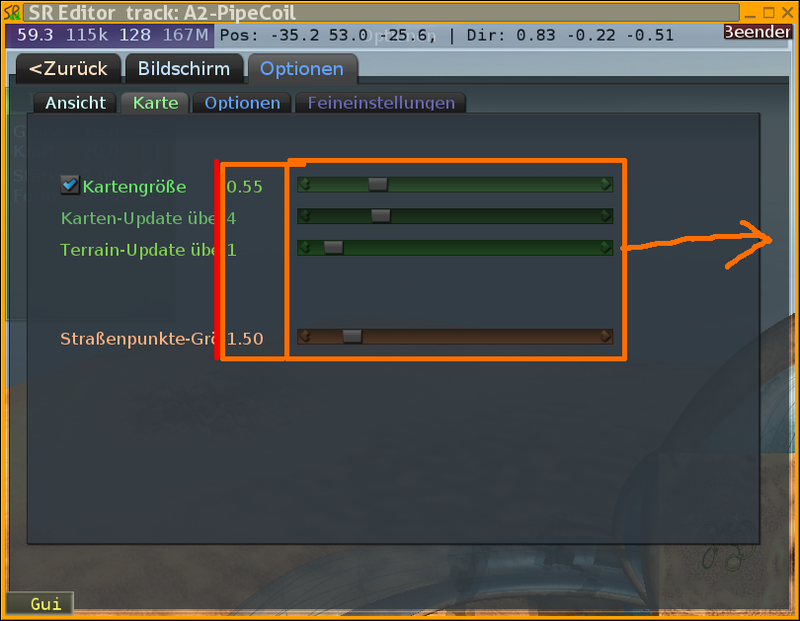 This thread is about changing the arrangement of many things in the menus so there is more room for strings. While translating, I noticed it is sometimes really hard to shrink the strings in such a way they still fit in. Many times it is hard to fit the strings into those narrow spaces. 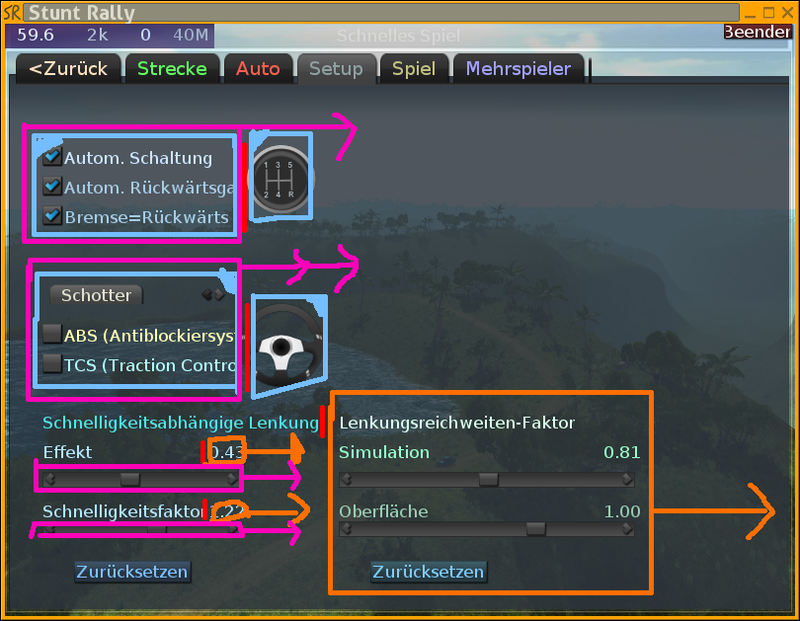 I have made some images which roughly show my suggestions for the cleanup of many menus. I used the smallest possible resolution so the suggestions should work out at any resolution. 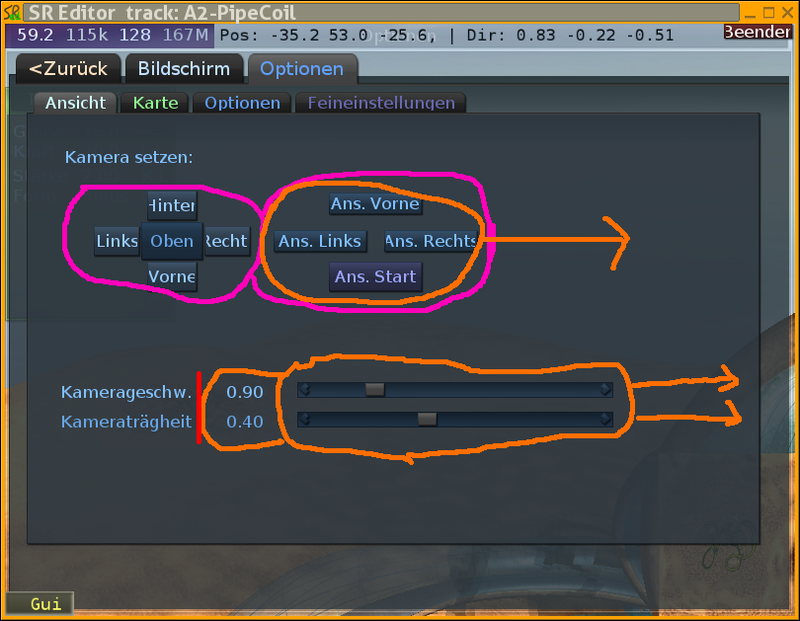 The suggestion involve moving around and resizing several objects on the screen to make more space for strings. 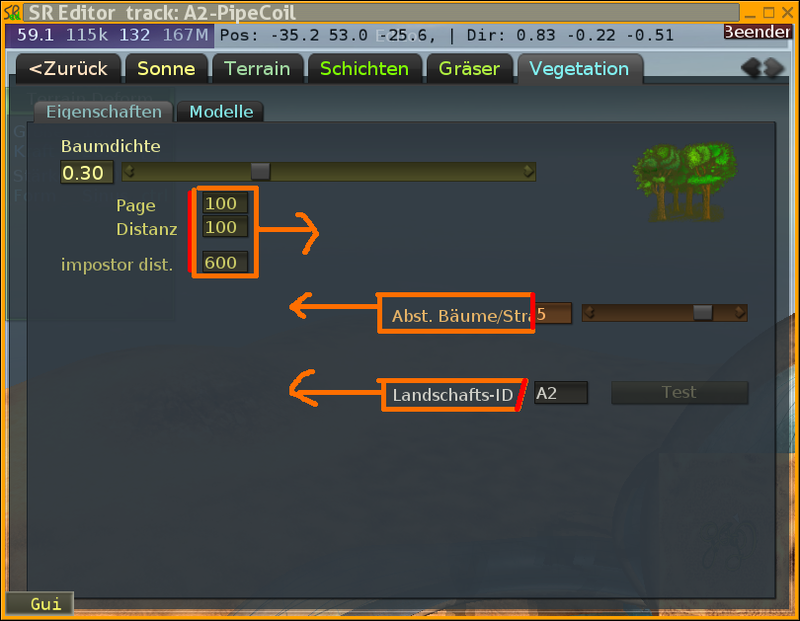 I enclosed several GUI elements in “boxes” or circles in different colors and drew some arrows. The colors stand for different transformations I suggest to apply. Yellow: Shrink the object into arrow direction. The arrow is inside the box. Pink: Enlarge the object to arrow direction. If there is no arrow, enlarge to all directions. Light blue: Swap this object with the object with the same marked corner. Black: Remove the enclosed object, iff other transformations would make that neccessary. Red: Denotes the space for a string is rather short here and may get cut off at this point. It is used to show where the problem lies. An arrow may show to which direction the label could be enlarged, so this is similar to pink. Green: Here is one or more non-translatable string. White: I don’t understand what this object does here / what it means. Gray: I made a mistake here. Ignore this. If there are multiple boxes nested, the suggestion is to apply the inner transformations first. Most of the time, arrows only denote direction, not the exact position of a transformation. Arrow shape does not matter. Overlapping arrows also have no special meaning. Multiple boxes sticking together are usually considered a single box. Woah. Ok this is an issue which I'll deal with, but not everything at once. But firstly what the hell is that resolution 800x600 sth ? Nope, it is not supported. I.e. should work, but if such issues appear I'm not fixing them on 800x600. Minimum resolution is 1024x768 and any size problems should be considered there. OK. So the red marks with too short text area I'll fix asap. The white marked texts on right are like a category for this which comes below. 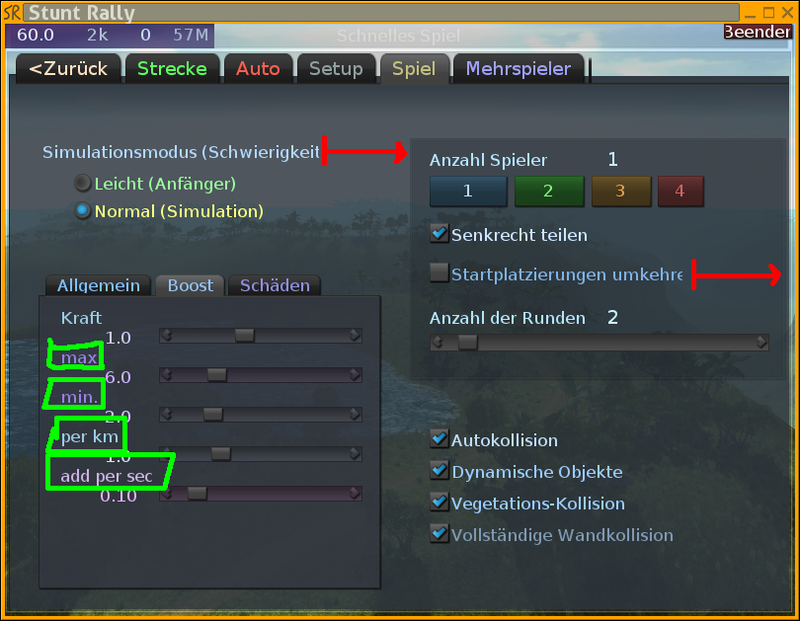 So if you have Terrain on right then the next few sliders (with same color) will be connected to terrain somehow (e.g. 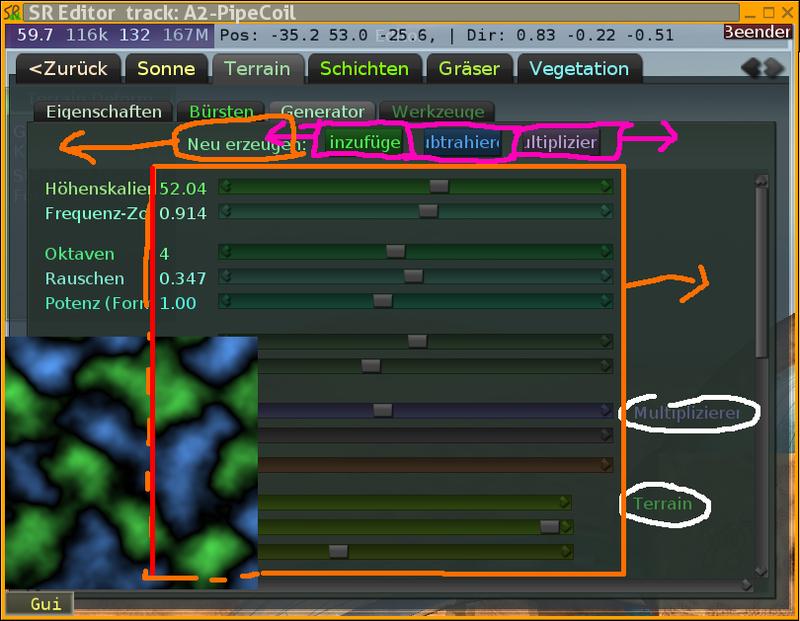 on grass channels, or generator tabs). Most of green stuff, I don't intend to make translatable even, seriously I didn't ever hear of anybody editing car or using graphs (but I use them a lot). Texture size yes, will do. Boost params are really new, IDK if they will stay, or deserve to be translatable . 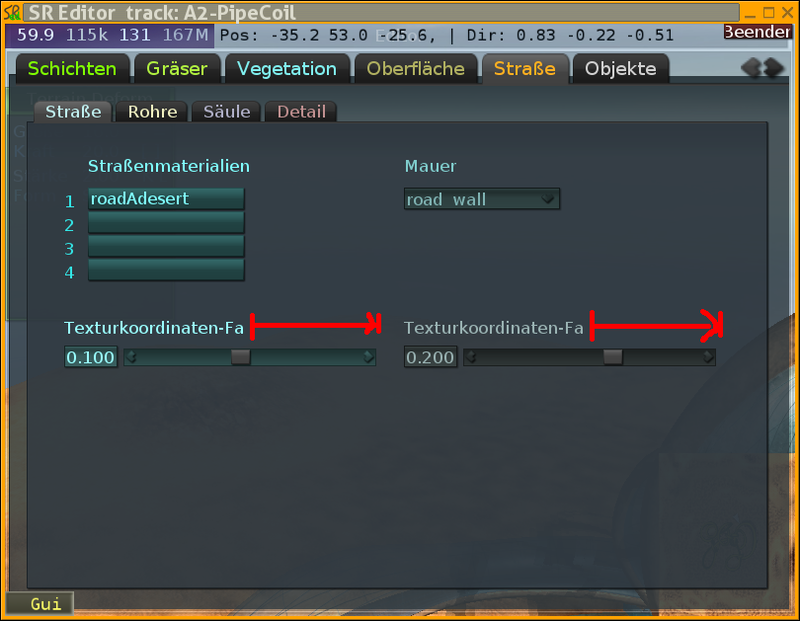 Tires, surface, particle names can't be, those are the names from game data files. Well maybe could but why, they can change or be renamed any release. The orange and magenta stuff I just see as moving a lot (too much) of stuff to right. 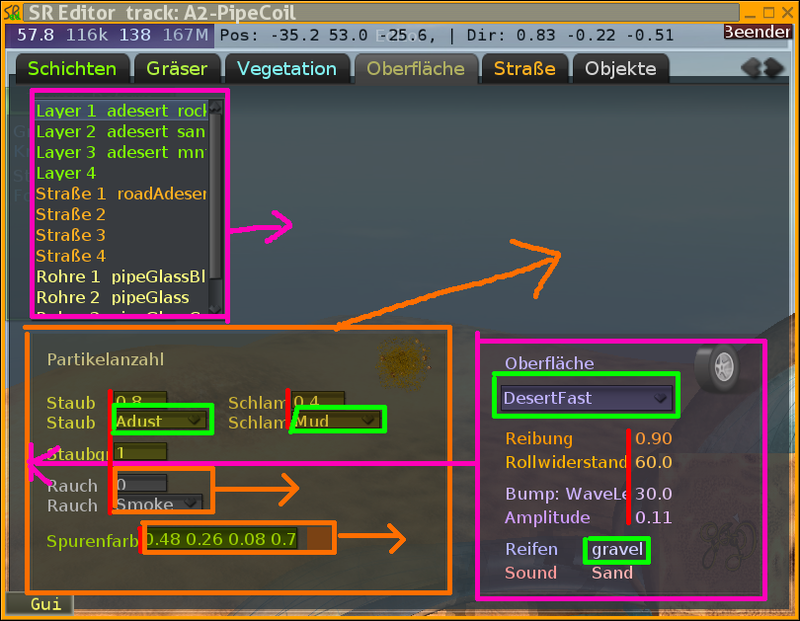 I'd really like if you did all this on 1024x768 since half of that won't be needed, and I also don't want to move those because, in 1920x1200 there is already a lot of space there (red vertical lines) which makes names and their values maybe too far (or would be if moved). Ah and yellow I don't want to shrink any slider, the height sliders and layer scale are the ones that need to be big to allow precision. Sun tab will be probably split to Sun and Fog (fog and weather), then there will be more space. Surface tab is under development still (but will be released so), but I like it so. I did this only on 800×600 so the screenshots are smaller. Okay, I checked this on 1024×768 and the situation looks very similar here. It is not really neccessary to post new images. One thing which would not require to change (I guess) under this resolution would be the list of surfaces. But most other stuff, especially the red lines, is still needed/suggested. On this resolution there is also basically empty space to the right side. 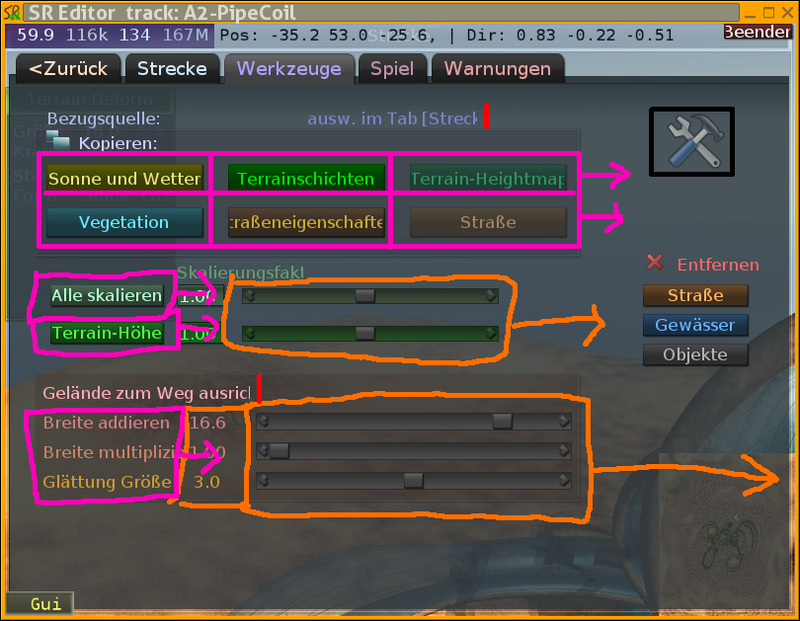 By moving stuff to the right, there can be more space for the text labels, which helps translators. The magenta/pink stuff is not for moving but for increasing their size, because there is too little room for text. Also note I sometimes have drawn a red line on an orange line; it may be hard to see. I used orange to make more room for text, so it is not pointless. Okay, on screenshot 8 the moving around is not really neccessary, more for “playing it safe”. 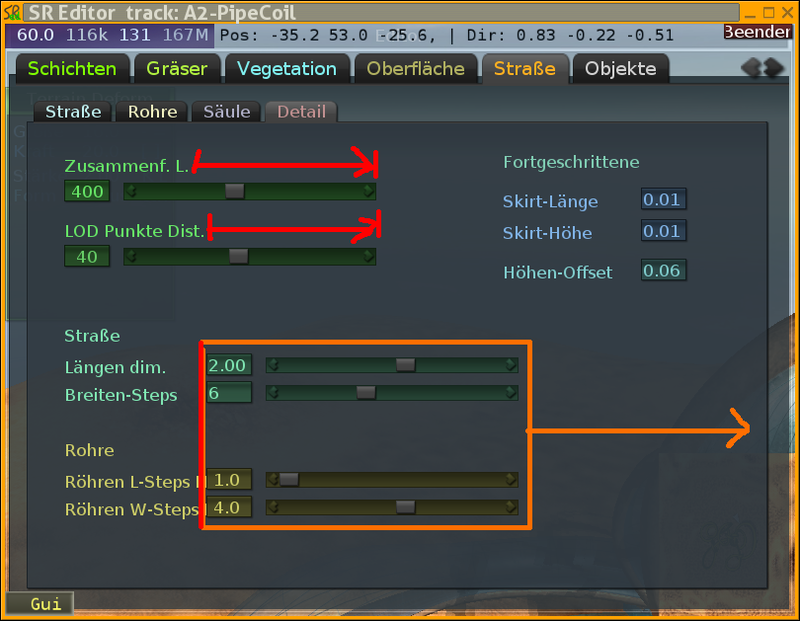 1. done moved right on Setup tab, also some rework on Game tab. 9. done, but honestly if you have Rohre above you simply shouldn't put Röhren in below 2 strings.